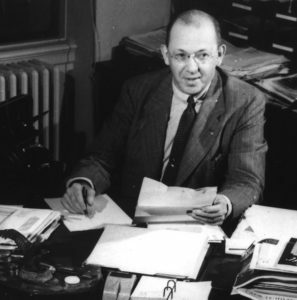 Robert P. Fischelis, Executive Secretary of the APhA, at his desk in the late 1940s. The Robert P. Fischelis Award was established in 2015 to (1) honor the contributions of Robert P. Fischelis to the organizational wellbeing of the American Institute of the History of Pharmacy, and (2) call attention to particularly meritorious and commendable actions that have an important impact on the field overall or on the Institute itself. Noteworthy contributions to the AIHP or its field may include: a substantial gift; the creation of an exhibition, work of art, film, television program, or other entity that promotes the mission of the Institute or the field of the history of pharmacy nationally; initiation of an academic program; fundraising leadership; organization of a one or more major AIHP events; and other contributions deemed exceptional by the AIHP board of directors. Nominations for the award are invited from current and former members of AIHP’s Board of Directors and other Institute members. The Board of Directors reviews nominations and determines whether to confer the award. Previous Winners of the Fischelis Award.